After much debating back and forth about keeping it to ourselves, we're going to let San Francisco into one of our favorite little secrets: the secret menu at the Coachman in San Francisco's gritty part of SOMA. As if you needed another reason to check out their extremely creative program, someone allowed bar manager Johnny Codd near liquid nitrogen, fire, fireball, and a smoke machine, and this menu was the fantastic result. If you are at the bar and you ask for it, you'll be allowed to choose from a short list of these sippable wonders. They run for $14-$16 and are perfect to impress a date or just to add a bit of fun to your evening. 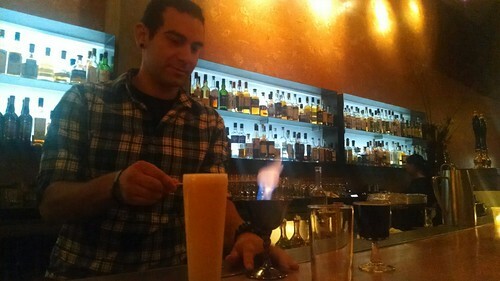 The bartender sets a goblet on fire with high proof alcohol and toasts a marshmallow in front of you. Then you can enjoy bites of gooey toasted marshmallow paired with rich, chocolatey porter, and a cocktail of rum, Carpano Antica sweet vermouth, cream, and toffee syrup. What's better than your favorite cocktail? 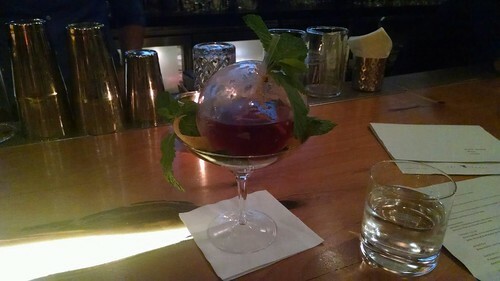 Uh, your favorite cocktail in a freaking ice sphere. We have so many favorite tiki drinks, we just can't choose our favorite! And why should we have to with this awesome (and did we mention adorable?) tiki trio, which includes a Mai Tai, Pain Killer, and Pina Colada. Don't forget to wear sunscreen. 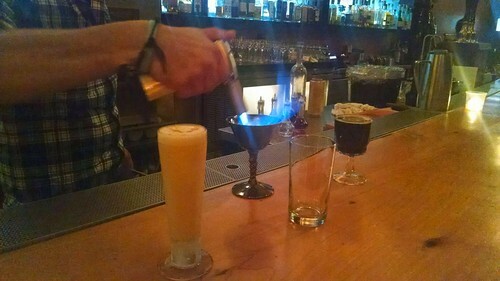 Choose from Buffalo Trace, House made fireball, or Hunting Flask (one of the house cocktails made with infused Redbreast whiskey). Then decide on mesquite, apple, hickory, or cherry wood chips. Add smoke. Is this what you think you see? If you're wondering that, the answer is probably yes. At one time, something cheeky was made of this delicious adult icee—and by that we mean a blended negroni, a super cold, thirst quenching, and somehow creamy cocktail of campari, sweet vermouth, and gin whipped up in a Vitamix with ice (Johnny likes to add a little squeeze of lime over the top, as well as some egg white to the mix). 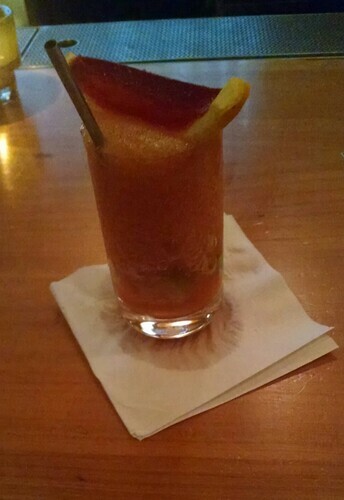 The garnish was a negroni jello in a real orange peel. These days, they've added a bit more to the order. Instead of the blended negroni (still available upon request, and we recommend you do on a hot day), you get a cheeky trio: a deconstructed sazerac in an absinthe ice glass (you're not hallucinating), a cheeky of housemade fireball, and the jelly negroni.